Home / Chris's Posts / Telemarketing – Cost Or Investment? Running a successful telemarketing company is as rewarding as it is challenging but one of my greatest challenges is definitely to give prospective clients the right advice before embarking on a telesales or telemarketing project. Of all the things to think about ROI has to be top of the list. Our clients are only spending money with us so they can make even more money for themselves – simple as that. So then, the challenge is trying to see into the future and predict what might be the outcomes of any such activity. Obviously every industry is different but we do see a distinct shape to the results we’re able to get for our clients which, strangely, is roughly the same for Accountants as it is for Contract Cleaners or Insurance companies. In the graph below (you’ll need to click the link) we can see that the longer the work is engaged in the greater the returns in a compound or cumulative way. The problem here is that when we tell a prospective client this they often think that we’re simply trying to just take more money off them so see it some elaborate rouse. This graph shows what happens if we continue to work for say two days per week for three years for a client. It shows that for every £ spent over this period the activity will be yielding 3,000% more in revenue and we have enough case studies to hand to know that this is actually quite modest in some cases. What’s interesting however is what happens if we stop working after say, three months. Our clients focus on appointments that have been made by the end of this campaign and value the effort purely on appointments already sat. This is just the tip of the ice-burg as far as most telemarketing is concerned. As a child you may have had a spinning top (I could just be showing my age here, ahem!) Any way, if you did you’ll know that the whole point of the toy was that you wound it up and it would carry on spinning, unaided, long after it was touched by human hand. By conducting a campaign purposefully to have this effect we can continue to bring value to the sales process long after our clients have stopped using us. It’s practically impossible however to convince our clients of this but again we’ve enough evidence to know it’s perfectly true. For example; we conducted a three day telemarketing campaign for a number of franchisees within the contract cleaning space. Most were ‘disappointed’ with the results stating that the number of appointments weren’t enough to justify their £600 investment. However, during a national sales conference some 12 months later the campaign came up in conversation and all participants reported additional revenue of between £80k and £100k as a direct result of the work we did for those three days. The instant, ‘just add water’ world we live in these days means that we all expect instant results, especially if what we’re engaged in costs money. We see most marketing as expensive and often don’t really know what we should be doing to get to our target markets in the most cost efficient way possible. 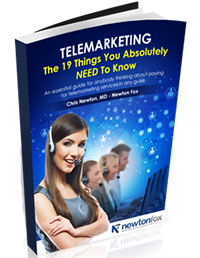 Telemarketing, or at least high quality telemarketing, isn’t cheap and it isn’t for every business. I see my job as being primarily to talk a very straight talk to any company thinking about telemarketing for their business and to illuminate the way to how best to proceed, if at all. This is why we have such a good reputation and why some companies have been with for several years. What we do works but it isn’t a get rich quick scheme and it’s not for the faint hearted. However, for those companies willing to invest over a significant time period it will almost always bring better results than had been dared hope for.